Boveda packs come in a range of different sizes and relative humidity (RH) levels, allowing you to find something perfectly suited to your needs. You have two factors to take into account when choosing a humidity pack: the size of your container and the optimal humidity level for your herbs. 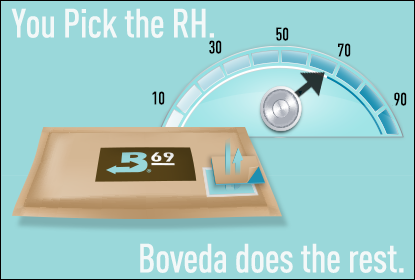 Boveda packs currently come in five different relative humidity levels: RH 62%, RH 65%, RH 69%, RH 72% and RH 75%. The optimal RH level for you will depend on both the herbs you are using and your personal preference, but around RH 62% is generally ideal for storing cannabis. RH 62% – Research has shown that RH 59% – RH 63% is the ideal humidity range for storing cannabis. RH 62% packs fall right inside that range, making them ideal for all you marijuana storage needs. RH 62% humidity packs are also commonly used by cigar smokers who live in a more humid climate or prefer a drier smoke. RH 65% – Although this RH level is slightly below what is recommended for cigar storage, these packs are favored by some cigar smokers who live in a more humid climate or enjoy a dryer smoke. 65% humidity packs can also be useful for storing cannabis when air leaks are possible, as the RH level will naturally veer towards the optimal range. RH 69% – RH 69% is the optimal humidity level for storing cigars and tobacco. RH 72% – Easily the highest selling humidity pack, the RH 72% is useful for storing tobacco in an environment where air leakage is possible. With the natural escape of humidity, the RH level will drop towards the optimal level for tobacco storage. RH 75% – Although too high for cigar storage, this level can be suitable for use in containers where air leaks are possible. Maintaining your herbs at the optimal RH level provides numerous benefits. Not only are Boveda packs ideal for curing, they also enhance the freshness, potency and color of your herbs.